PaintCare Inc. About - PaintCare Inc.
PaintCare Inc., a non-profit 501(c)(3) organization, represents paint manufacturers (paint producers) to plan and operate paint stewardship programs in U.S. states and jurisdictions that pass paint stewardship laws. PaintCare is a program of the American Coatings Association (ACA), a membership-based trade association of the paint manufacturing industry. Working through the Paint Producer Stewardship Initiative (PPSI) facilitated by the Product Stewardship Institute (PSI), ACA supported the passage of the first U.S. paint stewardship law in Oregon and established PaintCare in 2009. PaintCare began in Oregon as a three-year pilot program. After successfully demonstrating that the industry can design and deliver a program for post-consumer paint management, the Oregon program became permanent through new legislation in 2013. Similar laws have passed in California, Colorado, Connecticut, the District of Columbia, Maine, Minnesota, Rhode Island, and Vermont, and we expect additional states to pass legislation in the future. 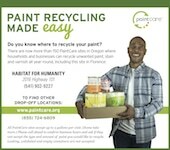 In parts of the United States where PaintCare operates, we encourage households, businesses, and individuals to take their unwanted, leftover paint to a PaintCare drop-off site. There it is sorted and managed for reuse, recycling, energy recovery, or safe disposal. 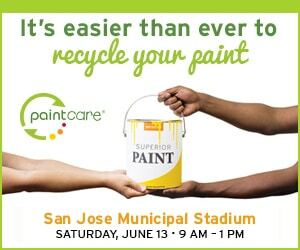 Without a PaintCare program, the best options for consumers to recycle or dispose of leftover paint are government-run household hazardous waste (HHW) facilities and one-day “round-up” events. However, these programs offer limited days and hours, are often located in remote areas, and most do not serve painting contractors and other businesses. In states with PaintCare programs, additional paint drop-off locations have been established to increase convenience and provide service to all paint users. Most locations are paint retailers, which are convenient locations open year-round and seven days a week. Across the nine PaintCare states, there are more than 1,750 drop-off sites, 77% of which are paint retailers. PaintCare is funded through fees on each container of architectural paint sold in states and jurisdictions with paint stewardship programs. Budgets and fees are set on a state-by-state basis. Please see the PaintCare fees for the amounts in each state. Download PaintCare’s brochure to learn more about its impact across the U.S.
PaintCare believes there are opportunities for developing new recycling options for the fraction of latex paint which is not recycled today; however, more work is needed to advance these ideas towards commercialization. 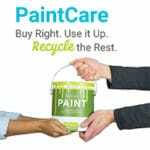 PaintCare’s Innovative Recycling Grant Competition identifies the best ideas for recycling leftover latex paint and provides grants of up to $100,000 to help make them a reality. Learn more. Where can I take my leftover paint? 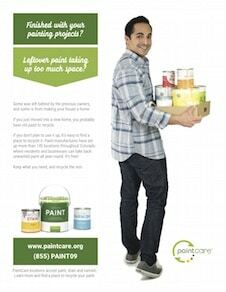 In PaintCare States, there is probably a drop-off site near you. Use our Site Locator to find sites in your area. In other states, our locator will list your nearest local household hazardous waste program. 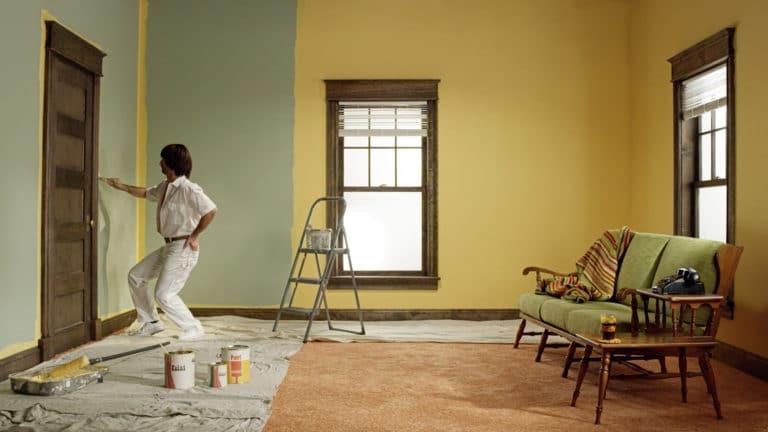 PaintCare Fees are applied to the purchase price of paint in every PaintCare State. Fees are set on a state by state basis and range from 35 cents to $1.99 depending on the size and state. For a list of fees in each state please visit our Fees page. Fees are set to cover the cost of a fully operating program on a state-by-state basis. First, PaintCare estimates the total expenses to run the program in each state. Next, we estimate the annual paint sales in each state for each size container. Next we divide the estimated total expenses of the program by the number of containers to be sold in the state ─ taking into account each size container. Since PaintCare is a non-profit organization, the fees may be decreased in the future if they were set at a level higher than what is needed to cover expenses, or fees may be increased if they were set too low and do not cover expenses. Does it cost me to take back paint? No, there is no charge for dropping off your paint. Do I get my fee back? Is it a deposit? No, the fee is not a deposit. Fees are used entirely to cover the expenses of running the program and not given back as a deposit for the return of paint or empty paint cans. Do all retailers take back paint? No. Retailers who are serving as PaintCare drop-off sites are volunteers. Not all stores have enough storage space or staff to be drop-off sites. Typically, about twenty percent of paint retailers in any state participate. If you know of a store near you that would like to be a PaintCare drop-off site, ask the manager to contact PaintCare. We’re always interested in adding more drop-off sites. Contact Brett Rodgers at brodgers@paint.org or (202) 719-3707. For information about media in a particular PaintCare state, please see the state’s annual reports. Annual reports can be found under “Official Docs” on each state’s web page. Select samples of PaintCare’s advertising and media placements are shown below. La pintura a lo largo de las décadas ¡Los colores y los estilos cambian con los tiempos! Otra cosa que ha cambiado, qué hacer con sobrantes de pintura de la casa. Ahora puedes reciclarlo con PaintCare – es fácil. 30 sec. 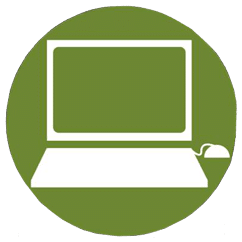 Video Series: Keep What You Need, Recycle the Rest! Keep What You Need, and Recycle the Rest! Why not get some of that space back where you’ve been storing paint? Now is a great time to keep what you’ll use, and recycle the rest. Find a drop-off location near you… 30 sec. ¡Guarda lo que necesitas, recicla lo que sobra! ¿Por que no reclamas un poco de el espacio en cual has estado almacenando la pintura? Ahora es un buen momento para mantener lo que vayas a usar y reciclar el resto… 30 sec. Chinese radio ad used in California. Hey my name is Taxicab Yellow…If you’re done with us, we get it. Hey I’m Malibu Pink …You thought you would use me up? I am so sure. Hi, I’m Forrest Green … You can be as green as I am. Hey honey, what’s our plan for that old paint in the garage? Los restos de pintura ocupan mucho espacio? The following billboards have appeared in California, Connecticut, and Oregon. The following sign was developed for display on trucks operated by the Denver Department of Public Works (Colorado). December 18. PaintCare launches its Innovative Latex Recycling Grant program, offering grant funding to aid commercialization of new ideas for recycling the small fraction of latex paint that cannot be recycled. Waste 360 picked up the story. December 12. The Painting and Decorating Contractors of America (PDCA) interviewed Nichole Dorr, PaintCare’s Central California regional coordinator for its paintED podcast series. October 31. 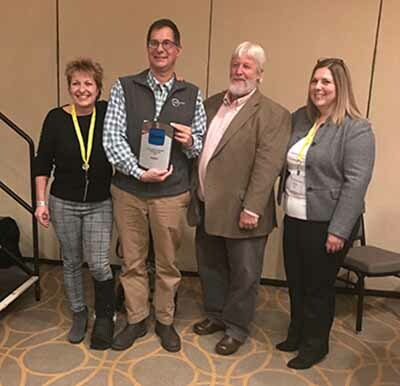 PaintCare was awarded the Northeast Recycling Council’s 2018 Environmental Sustainability Leadership Award in recognition of its outstanding paint recycling operations in Connecticut, Maine, Rhode Island, and Vermont. A press release was published by PR Newswire, and a news blurb appeared in Recycling Today. September. Several of PaintCare California’s recent paint drop-off events were covered in local papers in Susanville, Truckee, and Yreka. July. Westword features PaintCare’s mural project in its “Street Art in Denver We Love Right Now” round-up. July 5. Waste 360 highlighted PaintCare’s leading role in the field of product stewardship (January 11) and then followed up with a more detailed profile. April 26. 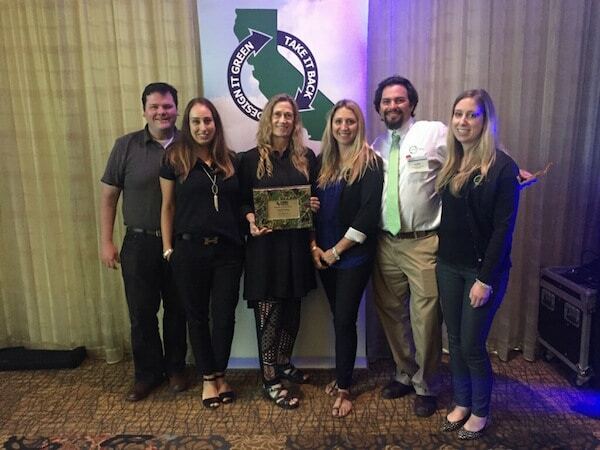 PaintCare’s Southern California coordinator Brandon Nelson-Zarrahy spoke to KHTS in Santa Clarita. March 29. PaintCare featured in Spring 2018 Home & Garden section of Colorado’s Douglas County News-Press. November 17. 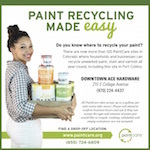 PaintCare California reaches 12 million gallons recycled, as reported by the Santa Clarita Gazette. May 23. Listen to the Portland Radio Project discuss PaintCare during interviews with Jeremy Jones, PaintCare’s West Coast Program Manager, Steve Dearborn, CEO of Miller Paint and PaintCare Board Member; and Jim Quinn, MetroPaint Hazardous Waste Program Manager. May 8. (national): Marjaneh Zarrehparvar, PaintCare’s Executive Director, was interviewed by the Painting & Decorating Contractors of America (PDCA) for the organization’s “Paint ED Podcast” series. Podcast about Paint Recycling for Professional Painters. February 24. KUSA Channel 9 (Colorado): Next Question: Did you realize there’s now an extra $.75 fee on gallons of paint? Listen to the WILI radio interview with Tom Metzner and Lee Sawyer from from Connecticut Department of Energy and Environmental Protection (DEEP) about the state’s comprehensive materials management strategy. The segment about PaintCare starts 6 minutes into the interview. 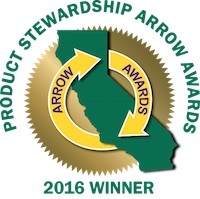 WILI is a station in Willimantic, CT.
California Companies Recognized for Outstanding Achievements in Product Stewardship. June 23. The Business Times (Colorado): 290,000 gallons of paint collected in recycling program. February 27. 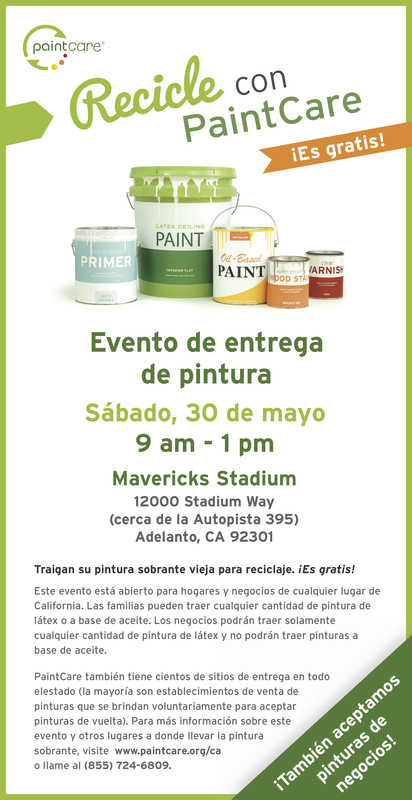 The Santa Clarita Valley Signal (California): Event helps Santa Clarita residents give new life to old paint. February 2. Northeast Recycling Council (Vermont): Painting Product Stewardship Success. December 14. PaintCare releases 2015 annual report (California): PaintCare collected and processed more than 2.7 million gallons of paint. November 10. Portland Radio Project’s Interview with Jim Quinn, hazardous waste manager for Metro, one of PaintCare’s partners (Oregon). November 9. 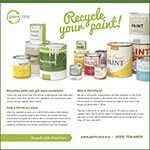 Northwest Community Television Channel 12 (Minnesota): Paint Recycling Program Helps Boost Business. November 5. Sierra Sun, North Lake Tahoe Bonanza (California): Truckee residents, businesses recycle 55,000 pounds of unwanted paint. The Accounts Payable Specialist is a member of the PaintCare and American Coatings Association finance department. This position will be primarily responsible for performing the accounts payable function of the PaintCare Inc. entity, a related organization of the Association, and requires 1-3 years accounting experience with a high level of attention to detail/accuracy due to the high transaction volume. PaintCare seeks a qualified candidate to join its communications team as a graphic designer. The position requires a creative professional who is multitalented, detail-oriented, and possesses a variety of artistic and technical skills. A collaborative, cooperative, and supportive approach to working on a team is required.